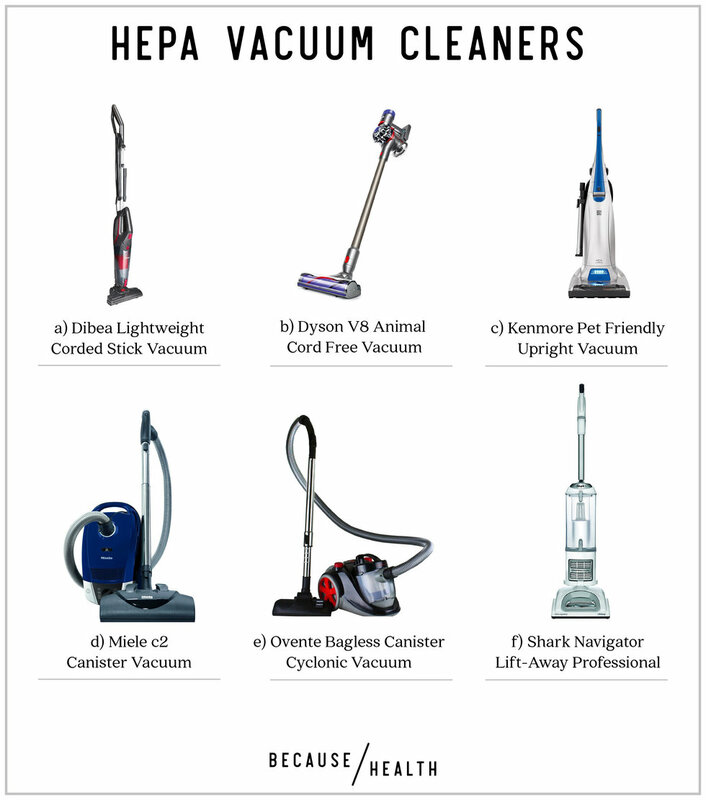 If your old vacuum is on the frizt or you're looking to make a new investment, we rounded up 6 HEPA filter vacuums in a variety of categories that are highly reviewed. We recommend vacuuming with a HEPA filter because HEPA filters basically catch and remove dust and small particles, instead of blowing them back out into the room. It's much better for children and people living with allergies or asthma. Whether you are looking for a cordless, or an upright vacuum, no matter your budget, find the option that's right for you. a) Dibea Lightweight Corded Stick Vacuum- If your place is small or you just have hardwood floors, then you probably don't need a big vacuum. A stick vacuum is perfect for these situations or if you don't have a closet to store a vacuum in. b) Dyson V8 Animal Cord Free Vacuum- This is our pick for an amazing cordless vacuum with a HEPA filter. Vacuuming stairs just got a lot easier! Bonus, all Dyson vacuums are certified to be allergy and asthma friendly by the Asthma and Allergy Foundation. c) Kenmore Pet Friendly Upright Vacuum- If you have cats or dogs this is the vacuum you need to be hair free. Bonus, it's also certified to be allergy and asthma friendly. d) Miele C2 Canister Vacuum- Miele vacuums are the crème de la crème of vacuums. This is the upgrade pick from product review site Wirecutter. We love the suction control settings on this vacuum, which make it easier to get those dusty drapes. e) Ovente Bagless Canister Cyclonic Vacuum- This is our budget pick for a HEPA filter vacuum that will easily get the job done. f) Shark Navigator Lift-Away Professional- This is the #1 reviewed HEPA vacuum (or vaccum of any kind really) on a bunch of online stores and comes with all the attachments you could need. As soon as spring hits, we find any excuse to go outside and spend time in the sun. If you have kids, outdoor time is often synonymous with heading to the playground. We LOVE the playground and always encourage kids to get outside and play! Washing hands and taking shoes off is a must after the park- so many germs! These habits could also help prevent exposure to two questionable materials that may be a part of your playground. The first is wood pressure-treated with chromated copper arsenate (CCA). This insecticide was sprayed on wood play structures because it made the wood resistant to degradation and insects. However, 22% of CCA is pure arsenic (1). Arsenic is a super nasty chemical that is classified as a known carcinogen by the World Health Organization. It can also cause "immune system suppression, increased risk of high blood pressure, cardiovascular disease, endocrine disruption and diabetes" (2). This chemical is not to be messed with! Over time, the CCA can be released from the treated wood and can end up on the hands and clothes of your little one. It can also end up in the soil around the playground, so your child may still be exposed even if they don't play on the wooden structure (3). The good news is that CCA treated wood was banned from residential construction in 2003. So if your neighborhood park has been recently built or renovated, chances are you don't have to worry about this. You can always check with your city or neighborhood association to see if CCA wood is in your local park. It also wouldn't hurt to double check with your kid's school to see what their playground was built with. Usually, CCA treated wood has a green tint, which can make it easy to spot. Even if your playground does have CCA, tt's pretty easy to limit exposure. If you're planning to have a picnic or snack at the park, make sure to use hand wipes or wash hands (if a bathroom is nearby) before eating. After returning home, thoroughly wash your and your child's hands. It also doesn't hurt to wipe everyone down with a wet wipe too! This will help get rid of any chemicals and other undesirables like pollen as well. Leaving shoes at the door can stop CCA-contaminated soil from tracking all over your house. Crumb rubber is another questionable material that could be found in your playground. Crumb rubber are those small black particles you find in artificial turf that seem to always end up stuck in your shoe/sock/bag/shirt/life/etc. It's actually made from old, used tires that have been chopped up into really tiny pieces. While this may seem like a good idea from a recycling standpoint, it's not great for health. Tire rubber contain a ton of bad chemicals like PAHs, phthalates, phenols and benzothiazoles (4), and the tires are not treated before they end up as crumb rubber. These chemicals are linked to serious health issues like endocrine disruption. The crumbs are so small that they have a habit of getting in your clothes and hair, accidentally getting eaten by curious babies, or sticking to your skin. Crumb rubber can also give off more chemicals as they're heated up in the hot sun. There's even speculation that crumb rubber might have played a role in the cancer of adolescent soccer players (5). When returning from the playground, you can leave shoes outside so soil and rubber doesn't get tracked around the house. Also make sure to wash your hands or shower! Avoiding play time when it's really hot outside can also limit the amount of exposure. If you've been around crumb rubber, make sure to dust yourself and your play equipment off before you leave the playground to get rid of any hitchhiking rubber pieces. Changing your clothes after returning doesn't hurt either! Let's face it, the allure of screen time is hard to pass up for kids... and parents too (who can deny that those 30 minute of silence when Paw Patrol is on are pure bliss). As tempting as it is to have shows on repeat all day, getting your kids to play outside is so important. Not only will it knock them out for bedtime, but outdoor playtime is good for your kid's body, mind, and happiness! There are so many health benefits of outdoor time for kids that it's hard to keep track of them all. Researchers have shown that it can reduce the risk for obesity and diabetes, and decrease ADHD symptoms. On top of that, it can increase Vitamin D levels, improve critical thinking skills and can help boost test scores. (1). You might be saying, "this is great and all, but how do I actually get my kids excited about going outside?!" We hear you! In order to encourage more outdoor play, we came up with three outdoor activities that are super fun for kids but easy for parents to set up. Try them out this weekend! Doing arts and crafts outdoors is a great way to get kids outside even if they aren't the run-around-in-circles type. Plus, all the mess is outside and you can just hose everything off after. One of our favorite outdoor arts and crafts is rock painting. We have the kids hunt for rocks in a variety of shapes and sizes and then bring them back to a station where they can paint some funny faces on them. It's so fun to see their creativity at work! Another activity is creating hammered artwork from nature (we'll explain). This one requires a bit more parental supervision, but it's totally worth it. The kids go and collect a variety of leaves, grasses, and flowers and then pound them between sheets of paper with a wooden mallet or hammer. The colors and shapes transfer to the paper to create some seriously cool art. We find that a thicker textured paper like watercolor paper produces the best results. Kids enjoy this so much they'll ask to do it over and over again! What if we told you that with just a few minutes of prep you could keep your kids outdoors and occupied for what can seem like countless hours? Sound too good to be true? An outdoor scavenger hunt will do just that! We like to make lists of adjectives (like soft, hard, green, round, pointy, long...etc.) and give the kids a basket to go find things in the backyard or neighborhood park that fit the description. Sometimes we even have the kids come back and do a show and tell and compare the objects they found. This one is a great activity as it starts warming up outside! Get a couple of water guns or squirt bottles and use them to play a version of freeze tag. Our version: someone is designated "it" and if they spray another player with water, they are frozen. If another player tags them, then they are unfrozen and can start running around again. Sometimes the game just devolves into everyone running around spraying everyone else, and that's fine by us! Feel free to kick back and enjoy a glass of wine and watch, but we find it pretty tempting to play too. So there you have it- three easy outdoor activities that will help your kids get off their screens and back outside. We hope that they are a hit with your kids and will be on repeat all summer. Are Allergies Another Thing to Blame on Climate Change? It's finally spring and we are loving all the warm weather - sandal season FTW! What we love less is all the pollen bringing out the best of allergy season. But, it might not just be allergies that are making it hard to breath this time of year. Climate change is also to blame. Why you ask? It's because warm air holds more water, which leads to more humidity and rain. April showers are washing away the winter blahs and bringing those gorgeous May flowers, but climate change is bringing longer pollen seasons, and creating damp little ecosystems perfect for mold to grow and spread - not as pretty as flowers, *sigh* we know... If you are thinking you're safe because you are in a part of the country that is more prone to drought than rain, say hello to more dust and soot in the air from things like cars, trucks and buses. Globally, air pollution from burning fossil fuels is the 4th highest cause of death after high blood pressure, diet, and smoking. These airborne chemicals and particulates damage our lungs and can lead to heart disease, stroke, and cancer. Even less fun, ozone can make you more sensitive to allergens creating a double whammy effect. While we've healed the ozone layer in the sky that protects us from harmful UV rays, we need to do better to keep it out of our lungs. And, all of these are a result of our use of fossil fuels. <img lazy-loadable="true" src="https://media.rbl.ms/image?u=%2FbhSi84uFsp66s.gif&ho=https%3A%2F%2Fi.giphy.com&s=114&h=05410cad7b5e458326929ee03da1e7bef6ac9fb2306dbc820560192f47f8a203&size=980x&c=350064043" id="28a38" class="rm-shortcode" data-rm-shortcode-id="K8CEDA1556191249" />Giphy<p>We can all do our part to keep climate change (and allergy season!) from going from bad to worse. And, as an added bonus, it makes our neighborhood air healthier.</p><p>Three tips for reducing your consumption of fossil fuels are to:</p><p>1. Limit household energy use when you can and ask your local utility if your energy can be sourced from renewables like solar and wind. If they say yes, flip the switch to renewables! And if not, ask them to make it happen. They won't supply renewables if there's no demand, so let them know that's what you want. An easy way to limit household energy usage is to plug things into a power strip and flip the power strip off when you leave for the day or have it on an automatic timer. That way things like your TV, phone charger, and wifi router aren't eating any extra energy throughout the day when they aren't being used.</p><p>2. Combine car trips (like doing all your errands in an afternoon instead of one a day), carpool, or take public transportation to reduce greenhouse gas emissions and local pollution. Walking or riding a bike when you can is an even better way to improve the health of the planet and yourself while you're at it. </p>3. Planting trees and gardens have also shown to <a href="https://depts.washington.edu/hhwb/Thm_Risk.html" target="_blank">improve air quality</a> by reducing pollution and mitigate the urban heat island effect. Plus, they look pretty and can provide food if you go for something like a citrus tree or tomato plant.